The regularly-scheduled look at the craft can wait, because there’s something more important to address. Back in March it was reported that 52yo director Kazunori Mizuno had passed away, though the news only seemed to catch on weeks later when it was mentioned that he died at the studio, while taking a short nap he never woke up from. This got widely misreported as “Naruto animator dies”, following the exact same pattern seen when an A-1 production assistant committed suicide a few years ago; we’re in a fandom that loves to express their worry about industry problems, but where even the news outlets can’t be bothered to check the job of people who lose their lives to those issues. The least we can do is to take a proper look at the events. Mizuno had made a name for himself as an action storyboarder and director despite not having joined the industry as an animator, which is quite unusual; it’s not that he was unable to draw, but it wasn’t his area of expertise, thus making his solid grasp of action all the more impressive. While he was a freelancer for most of his career, it was at Pierrot in particular where he flourished, and so he kept a very strong link to the studio and related companies like Arcturus. Bleach firmly established him as a creator you shouldn’t miss after having shown promise in the likes of Yu Yu Hakusho, and in recent times his main occupation had been Naruto Shippuden. Its penultimate episode, directed and storyboarded by Mizuno, aired just 3 days before his death. People assumed his exhaustion was due to him preparing work for its successor Boruto, but that doesn’t seem to be the case, and that’s where this episode comes into play. 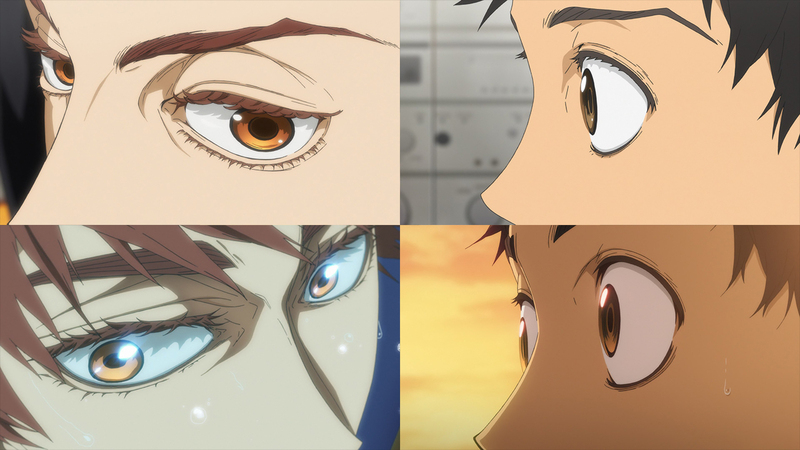 Welcome to the Ballroom #02 was outsourced to studio Pierrot – more on this later – and produced earlier this year. The harrowing proof is that the first person credited for directing the episode, Ogura Shirakawa, is none other than Kazunori Mizuno under a pen name; hence the unusual presence of three episode directors, since his Naruto comrades had to become his replacement in such dreadful circumstances. Rather than Boruto as assumed, it was juggling between Naruto and Ballroom that proved fatal. This is a tragedy on an individual level, but also highlights systemic problems that we must talk about properly. For starters, it’s yet more proof that framing the anime industry’s issues as “animators struggling” is absolute nonsense, since the conditions of plenty of other workers are also inhumane. Even amongst animators, in-betweeners and clean-up artists are worlds apart from chief animation directors, and the creators suffering actually range from painters to production assistants. While episode directors are as a whole in a much better position, their role involves so much more responsibility that the more sustainable wages don’t necessarily make up for it either. Oversimplifying this only causes harm, and yet the west in particular is somehow stuck on the vague idea that it’s just “animators” who are having a bad time. Please be very skeptical of claims that international streaming services will “save” the industry by funneling money into it as well, since so far their projects have generally operated the same way when it comes to actually manufacturing the product; Yuasa’s upcoming Netflix series seems to be shaping up to be a healthily scheduled exception, but even then his small and manageable Studio Saru was already chasing different production models before. This is a complex set of issues that we can’t approach with the idea that we’re one press of a magical button away from “saving anime”. Change needs to happen immediately and on industry-wide levels. I don’t mean to say that small-scale initiatives aren’t positive, but beware that those are patchwork. More needs to be done. There is no way to smoothly segue from such heavy topics to standard analysis, so allow me to pretend this is a different post altogether and start anew. This episode was…perfectly serviceable, I suppose. Poor attempts at levity like the dumb walking-on-the-girl-changing-clothes scene coexisted with potent isolated moments like Tatara spying on Hyodo’s practice, so as far as I’m concerned it all averaged to simply alright. There’s something definitely noteworthy, though: having an outsourced episode, let alone to Pierrot and this early, is quite the surprise. The first season of Haikyuu! had a handful of those, but ever since #15 the entire series – meaning the second half of the original plus two sequels – had all been produced by this team at Production I.G. I don’t know whether they were trying to build a healthy backlog before the broadcast or if they’re making this a regular occurrence in the staff rotation, but their approach has clearly changed. The irony of the situation is that, in the end, this didn’t seem to save much time for the show’s key creators. The series director Yoshimi Itazu had to do extra work, the lesser drawings forced them to deploy both chief animation directors, and their ace animator had to redraw all tricky cuts himself. Chiba and Honda did a good job as supervisors – the detailed closeups of eyes stand out in particular – but it’s Takashi Mukouda who stole the show. His role of main action animation director means that he’s tasked with correcting all the intense dancing, but it seems that in cases like this where the drawings they received weren’t up to par, he’ll essentially make them all his own. The positive side of this is that we got an episode filled with enchanting Mukouda dancing, ranging from comedic to awe-inspiring. This raw scene in particular, in which series director Itazu himself was involved too, is without a doubt my favorite so far. 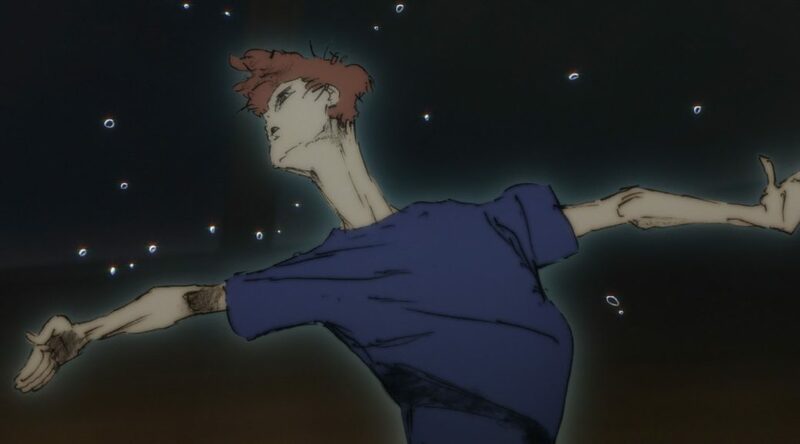 When I said that Ballroom could mark a move towards expressionism for this crew, it’s exactly this kind of work that I was talking about. As much as we can poke fun at the exaggerated necks, Ballroom is generally very mindful of realistic body movement, weight, even how articulations work. And then come scenes like this, where forms flow freely and anatomy isn’t a concern. The series is definitely aware of dancing’s duality of sport and art, which they’ve chosen to portray in this manner. Tatara was taken aback by what he felt was inhuman skill, which took the form of Mukouda’s almost Ohira-esque pencil lines. 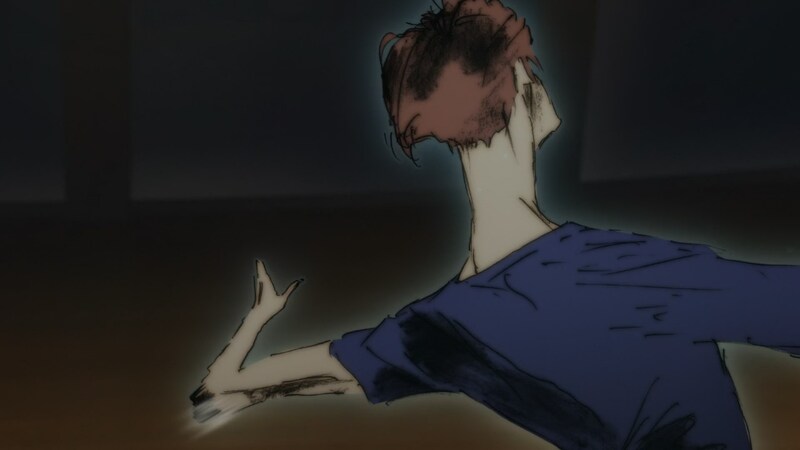 Itazu’s storyboard was a perfect complement as well, highlighting the impact Hyodo’s performance has on Tatara but also the clear barrier separating them at the moment. A very powerful scene making use of the tools only available to animation. Here’s hoping for more of this! Don’t feel bad about it, I’ve been advocating to halve the output for quite a while. It’s not as if that would magically solve everything and have no downsides (good luck asking companies that need to constantly produce a lot of work to survive to reduce their workload), but we definitely need to move towards that. Abysmal working conditions are literally everywhere around the world, and affect billions of people. The only way they could elevate their conditions is for them to be empowered to realize and speak out their concerns – decent wage, humane treatment. Apart from a culture that celebrates overwork, ridiculously low wage also compels workers to take in more work that they can reasonably handle. Huge demand can go long ways. But frankly this isn’t something that can happen overnight. For the record (and I don’t mean this as a rebuttal to you), JP anime industry members have been loudly and very concretely speaking out against the situation for years, and it’s only been in crescendo. The only reason many western fans think they’re alright with it because it’s part of their culture is because as a fandom we’re extremely good at ignoring what the creators say. The JP anime industry members might have been loud about things, but at the end of the day, not much has changed, someone dying recently only highlights this issue more. It seems to be getting worse actually, with insane amounts of anime being produced each season, more and more anime are being made and now I’m seeing a ton of companies that used to do nothing but shorts take on full length anime because the demand is so crazy in the market. Asking for help to fund a project and begging fans to pay their animators rather than doing it themselves is very different in my opinion. If this https://blog.sakugabooru.com/2017/06/01/p-a-works-animator-training-course-and-salaried-animators-program/ can be done then they ought to try too. I understand your point but we cant conflate the company and “the creators” especially if theyre big. Who said anything about begging though? Also, yeah it’s nice P.A. works have that initiative, but the animators will still get paid poorly and that’s only 1 studio, plus it’s going to take 2 years to reach that point. I really don’t see why I can’t directly pay a company like Trigger, what’s so wrong about it? I’d rather pay them than a middleman. I had no idea that Trigger even had a Patreon, much less the size of the company. Could you be able to do a post detailing major/famous studios and their sizes and current situations, as well as the level of healthiness for each company? It could be a good reference point for us Western fans, so that we don’t wind up throwing money at the wrong solution to a problem. They’ve not launched it yet, it’s just something they’ve been saying they plan to do for a while. A studio sizes post could be interesting…though it would have to heavily focus on how companies can have/lack entire departments, which can make similar number of employees form entirely different studios. The rest would be a logistical nightmare that would also lead to fans getting very nasty, so I’d rather not (which doesn’t mean I intend to stop talking about this stuff when relevant). Now, about the episode itself, I really enjoyed it. It makes me incredibly happy as a long time manga fan to see this adaptation and how good it is, it brings a tear to my eye ;-;. I also really loved Hyoudou’s scene at the end of the episode and I really appreciated the use of the sweat hitting the window to separate him and Tatara. Thanks for the great read!